Silver Birch is a short distance from our Office. 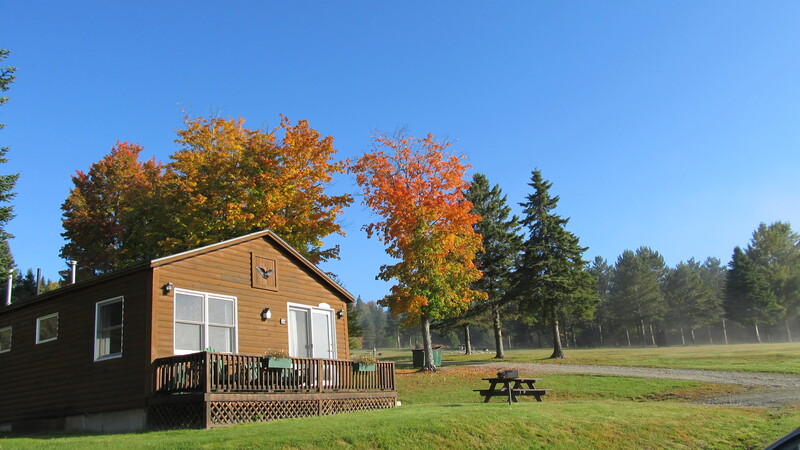 It is ideal for families who want to be close to family and friends staying in our campground. It is a short walk to the Cohos Trail. Don’t forget the great mountain views from the deck. Sunrise views of Mt. Magalloway from front east-facing deck (1/2 mile from lake). Log exterior, with adirondack chairs and barbecue in summer. Two bedrooms, full kitchen, 3/4 bathroom, and all linens included. Ridge Runners Snowmobile Club trails, Cohos Hiking trail and geocaching access. All cabins include: Ridge Runners Snowmobile Club Trail Access, Wifi and Verizon cell phone service, Kitchens with drip coffeemakers, gas stoves, fridges, microwaves and dishes for cooking and serving meals, sheets and pillows for the bedroom, as well as towels and soap for the bathroom. Access to Ramblewood property including private docks and pebble beach on First Connecticut Lake. Free paddleboat use and discounted boat rentals, walking/snowshoeing trails, free billiards, and lawn games.